Hello again fans of Middle Earth! 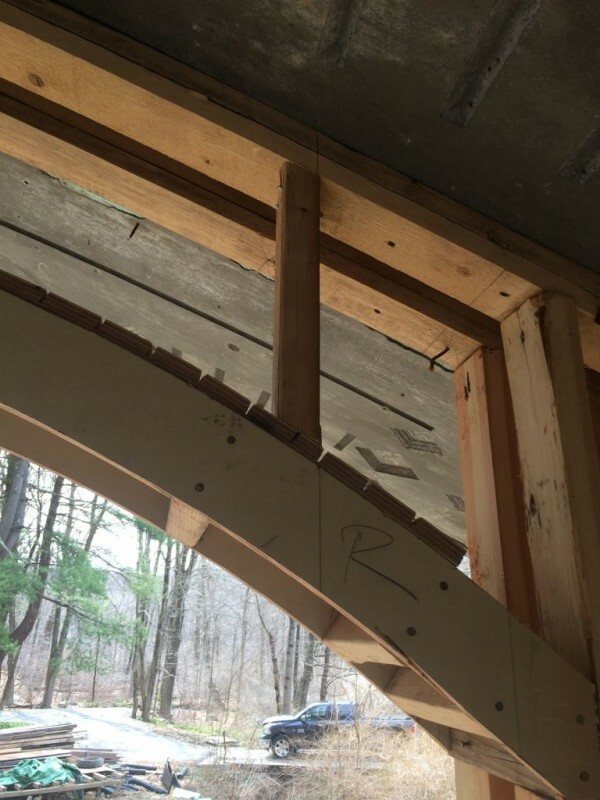 Glad to see you’ve returned for another installment of the Hobbit Hollow Construction Blog! Boy, oh boy. What a mild winter we’re going through here in the Northeast. No complaints from this Hobbit. I think we only plowed the driveway 3 or 4 times the whole season. The poor ski resort people. They had a tough year with the weather. I don’t know how they survive after going through a season like the one we just had. So the Editor got tickets for the two of us this Christmas to go to a “One Day University” seminar at the 92nd Street Y in Manhattan this Saturday. It was great. Just a little background. What is “One Day University?” In a nutshell, “One Day University” brings in the top college professors in a particular field and they lecture on the person or topic that they know about for an hour. It’s very interesting. The topic for this weekend was “Genius” with three professors speaking about someone in their field of expertise. Mozart, Michelangelo, and Shakespeare were the three geniuses they spoke of. Amazing people. Very interesting. So I met the Editor in Grand Central Station after work and we stayed in the city Friday night. We had a drink at Michael Jordan’s bar and grill right in Grand Central. I didn’t know he could cook! Nice bar. The seminar started at 9:30 Saturday morning. What a nice time we had. At the seminar we were sitting behind the crabbiest little old lady I think I’ve ever seen. What a grump. Reminded me of a Lobelia Sackville-Baggins. She never got over Bilbo living for so long…. I did run over to the house on Sunday. Just for a few minutes really. I wanted to try out this idea I had for the stud installation over the windows. Back to the nutshell. 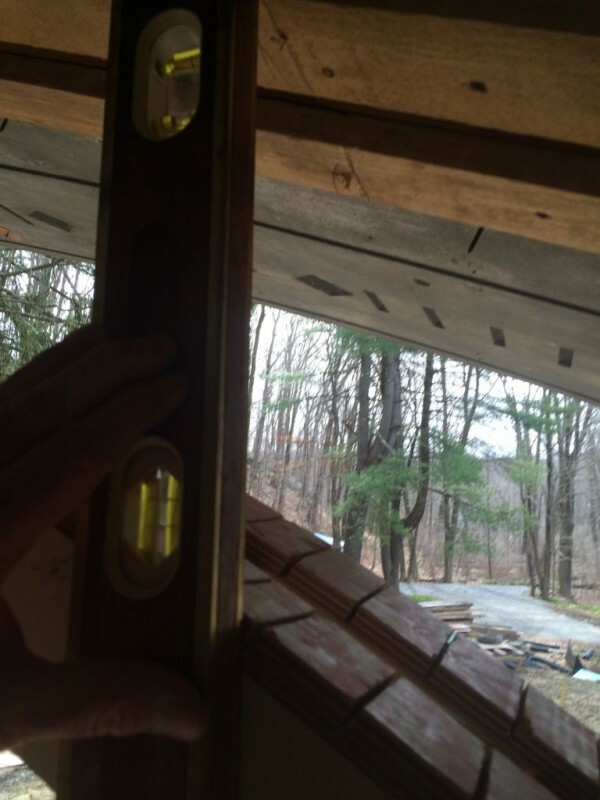 So if you remember last week I had said that I came up with an idea on how to cut the framing studs over the window. I just kind of wanted to try it to see if it would work ….and it did. I mean the whole idea was to try it so I could set up one of my sons to do it next week really. It’s pretty simple. Although the whole son thing helping me is a little iffy if you know what I mean. Let’s get through the week and see what transpires. Anyway, I have the stud layout on the top plate so it is only a simple matter of plumbing the stud layout mark from the top plate onto the window framing. Check it out. Plumb the stud layout marks onto the window frame with a two foot level. Okay, so I’m not so good at taking pictures with one hand. What can I tell you. I didn’t realize the picture came out the way that it did. I hope you kinda get the idea. You can sort of see the layout on the top plate if you look close. Then you just use the level to mark the window frame. Real simple. After that you just get a piece of scrap 2×4 and hold it to the two plumb lines and mark the inside face of the 2×4 to get the correct angles for that location. Hold the 2×4 in place and mark the angles. Once I had the angles I used a skill saw to cut them. I forgot to take a picture of this and this was actually the tricky part. I cut through most of the 2×4 and then re-marked the other side and then cut through the balance of it. I know this probably doesn’t make a lot of sense but it worked really well. Once it was cut I drilled a pilot hole through the bottom plywood plate in the wood window frame and used 2 1/2 inch screws to hold it in place. 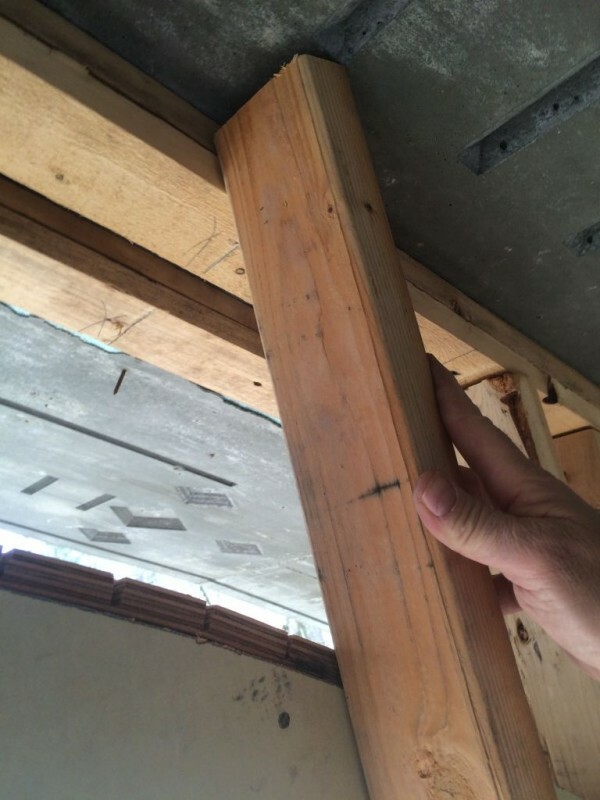 Then I nailed the top to secure the stud. I think that was one of the lousiest descriptions I’ve ever given on this blog. Sorry. I’ll try and clarify it next week. Here’s the final product. That’s one down 40 or 50 to go. I don’t know if the picture helps clarify anything but I’ll try to do a better job next week. On the home front we seem to have a serious problem with paper towels. I started my Sunday morning with half a roll of paper towels on the paper towel dispenser or whatever they call the things that hold paper towels. Fine. I think I used one of them. This evening after dinner I go to grab a paper towel and they’re all gone. What’s up with that?!!!!? How can this be? Terence begins this dissertation on how there really is less than half a roll of paper towels left because of the circumference of the paper towel tube and the shrinking diameter of the actual roll itself. His point being that there is really less than it seems. But we still used a half a roll of paper towels in an afternoon and nobody cleaned anything!!! That’s my rant for the week. I apologize. Paper towel expense is out of control. present at this sіte is actually excellent.